1. Combine vanilla wafers, pecans, powdered sugar, and cocoa in a large bowl; stir well. 2. Combine corn syrup and bourbon, stirring well. Pour bourbon mixture over wafer mixture; stir until blended. Shape into 1-inch balls; roll in (I used cocoa because hubby is a chocolate fan.) additional powdered sugar. Store in an airtight container up to 2 weeks. 1. Put cookies in a plastic bag and crush them into crumbs. 2. 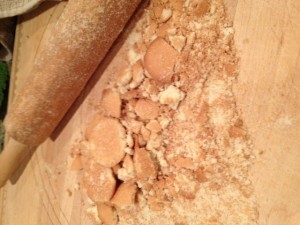 Combine the cookie crumbs, sugar, 1/4 cup cocoa, corn syrup & Bourbon. 4. Fold in the pecans. 6. Roll the balls in cocoa powder or powdered sugar to coat. This recipe yields 20-30 balls. Store in an airtight container and refrigerate.